Attention Young People! Don’t make the same mistake I did! I want to make sure my kids and the other young people in my life (and anyone else who might stumble across this article) understand the power of compound interest and savings. I WISH I had understood it before I hit my 40's! I’m not going to write a lot about what I would have done or wish I had done. I’m just going to leave a few numbers here* and let you see what YOU can do. For the following numbers, we’re going to assume you start saving when you’re 22 years old and that you are investing those savings in a low-fee total stock market index fund (like Vanguard VTSAX) that lives up to it’s well-established average annual return (which at the time of this writing is 8.06%) — we’ll go more conservative and use 7% for the estimates below instead. To simplify, a 7% return means that for every $100 you invest in the fund, on average, you’ll earn $7 on that $100 each year (which grows the amount you have invested…which increases your return incrementally the next year — THIS is the compound effect of interest earnings). If you save just $100/month, every month, for 30 years (you’ll be 52 years old), you’ll have saved $36,000, but with compound interest, that money will be worth $122,000! (at age 65, you’d have $325,000). BUT, let’s say you DON’T go buy a new car when you get your first job. Instead, you take that $300/mo car payment (and the extra $50 insurance you’d have to pay on it) and save it instead. You can still save other money to buy a car later…just delay it a year or two. What would that mean for you? 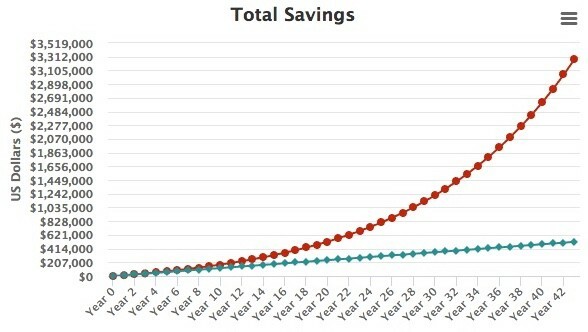 If you save just $350/month, every month, for 30 years (you’ll be 52 years old), you’ll have saved $126,000, but with compound interest, that money will be worth $427,000! (at age 65, you’d have $1,150,000). Ok, but WHAT IF you did the car delay thing AND you added that $100 from before — and add an extra $50 (yeah, it might be tight for the first few years, but as your salary grows, it’ll get easier)? If you save just $500/month, every month, for 30 years (you’ll be 52 years old), you’ll have saved $180,000, but with compound interest, that money will be worth $609,000! (at age 65, you’d have $1,638,000). If you can somehow figure out how to invest $1,000/month, starting at age 22, by the time you’re 50, you’ll be a millionaire! (at age 65, you’d have $3,275,000). Think about this now…if you’re married, and you both work, DOUBLE the numbers above! What if you could save 1/2 (or more) of your income? Yeah, it would mean you don’t keep up with your peers in spending, you might not have the biggest house or the nicest car, but it could also mean that sometime in your 30’s you’d have enough money to “retire” and do whatever you wanted with the rest of your life! *Disclaimer: These figures are based on averages and projections based on historical performance of the fund (VTSAX) as published by Vanguard. I am not a financial advisor, so do your research and make your own decisions. The stock market can and does vary over time and you can lose money. I enjoy writing sometimes. I don’t care about stats and have no goals here — other than to share. That’s all.